The Bingham High girls tennis squad surround the Region 3 championship trophy the team won with three individual region champions along with a second-place and third-place finish. The Miners placed third at the 5A state championship held Oct. 8 and 11 at Liberty Park. For the third year in a row, the Bingham High girls tennis team finished in third place at the 5A state championship which was held Oct. 8 and 11 at Liberty Park. The Miners’ No. 1 doubles team of seniors Amanda Balls/Bethany Morey – who are two-time Region 3 champions – advanced to the state finals, while No. 1 singles player Jean Noh, a junior, lost in the semifinals to the eventual state champion. Noh, representing Bingham at No. 1 singles with an undefeated record this season, and the No. 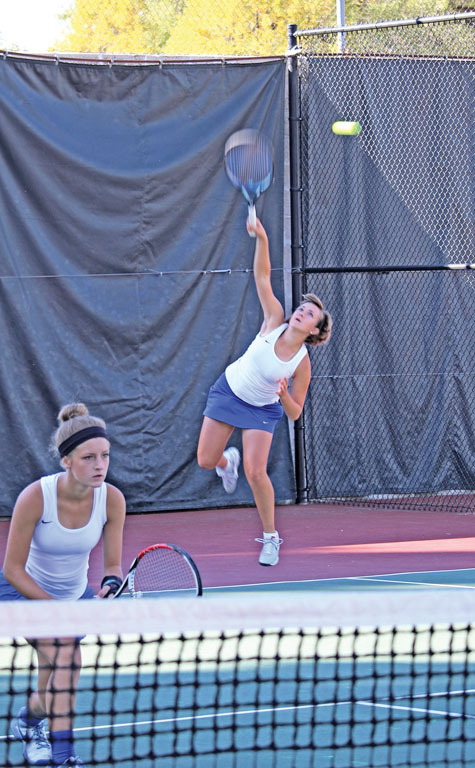 2 doubles team of juniors Lauren Fonda/Lexi Littledyke – who were also 12-0 on the year – also won region titles to help Bingham to the Region 3 championship as a team. Sophomore Rachel Winder, playing at No. 3 singles, placed third while No. 2 singles player Connie Park, a junior, took third. At the state tournament, Noh lost just four games to Northridge’s Brooke Woodruff 6-0, 6-0 and Hillcrest’s Mia Yu 6-2, 6-0 before reaching the semifinals where she lost to Davis’ Breezy Turley, who went on to win state, 6-1, 6-0. “We have never had a player at No. 1 singles make it that far,” Peterson said. At No. 2 singles, Park beat Lehi’s Kasia Colunga 6-2, 2-6, 7-6 and then lost to Caroline Poisignon, of Cottonwood 6-3, 6-1. Winder, at No. 3 singles, also reached the second round by defeating West’s Bita Tristian-Firouzi 6-0, 6-1, before losing to Courtney Davis, of Herriman 6-3, 6-2. 2013 state champions Bingham High’s Bethany Morey/Amanda Balls (right) won the Region 3 championship at No. 1 doubles and reached the 5A state finals before losing to Lone Peak’s Lauren Allen/Electra Cochran 6-4, 6-2 Oct. 11 at Liberty Park. Balls/Morey, who had never lost a region match as a doubles team before this year’s state tournament final, beat Northridge’s Savanah Visser/Tasha Jeski 6-1, 6-1, Shanna Stewart/McKenna Mathis, of Lehi, 6-1, 6-3 and Brighton’s Amelia Taylor/Sarah Fackrell 6-0, 7-5 to reach the championship match where the duo lost to Lone Peak’s Lauren Allen/Electra Cochran 6-4, 6-2. Fonda/Littledyke won its match-ups against Herriman’s Marie Heraldson/Sierra Moser 6-2, 7-6 and Davis’ Mequelle Montgomery/Alisha Watkins 7-5, 6-7, 6-5 before losing to eventual champions Oliva Harkness/JJ Bitton, from Lone Peak, 6-4, 6-2. Also playing for Bingham this year were seniors Allyson Davis, Mary Hunsaker and Marina Macbeth; juniors Karen Chen, Kortnee Johnson and Abigail Thomas; sophomores Emma Gould, Addilyn Griffin, Hanna Oviatt, Abigail Smith and Andrea Sorensen; and freshmen Jillian Jarvis, Alexis Loverless and Taylor Robin. Peterson was assisted by Phil Wolfgramm and GS Park.